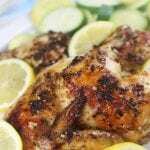 Easy Greek Chicken Marinade creates the best, most tender baked or grilled chicken. Perfect for whole chickens, chicken breasts or chicken kebabs. This marinade bursts with the flavors of lemon, garlic and oregano. Whisk together all ingredients for marinade. Set aside. Place chicken in a nonreactive dish or bowl. Pour marinade over chicken making sure all surfaces are covered with marinade. Cover and marinate in the refrigerator for 12-24 hours. Preheat oven to 425℉. Place chicken halves into a baking or roasting pan with skin side up making sure there is room between the two halves. Spread the congealed olive oil from the marinade evenly over chicken halved. Bake uncovered for 60-70 mins or until internal temperature read 165℉. Since oven times vary keep a watchful eye on the chicken starting at the 45 min marker.